Understanding what local deer will and won't tolerate in terms of deer human disturbance will give you a huge edge in developing a game plan for fall. Having captured the awesome 10-pointer on video, I hung my camera and reached for my bow. I wanted this buck - bad! A full two hours before dark, he was grouped up with two yearling bucks that were slowly feeding their way across my food plot. Each minute brought them closer: 70 yards . . . 60 . . . 50. In a matter of only a few more minutes, I'd be sending my arrow through his vitals. Suddenly, the bucks raised their heads and froze. Minutes seemed like hours as they meticulously examined the woods in search of the source of the undetermined sounds. Then a bowhunter's version of tragedy struck. One of the young bucks decided to bolt, dragging his buddies along with him. Less than 30 seconds later, the wide-racked 3 1/2-year-old 8-pointer emerged. As he made a scrape under my stand, I almost drilled him for costing me a shot at that Booner 5x5. Instead, I reminded myself what a gift it had been to simply observe a buck of that magnitude. What made that 2003 experience so special was not that I saw 11 bucks in a three-hour sit, or even that the big guy net-scored 174 inches and change. Don't get me wrong. I don't have that many afternoon hunts like that, and I was more than a little envious when bowhunter Tom Kovach later took that buck. However, the thing that made it special was that it was the third day in a row I'd hunted the edge of that food plot. Taking into account that it was late September, well ahead of the rut, I can't say I've ever done something like that before. In all, I ended up hunting that two-acre plot of beans five days in a row, seeing just as many deer come out early on my last sit as I had on my first. In years past, I'd have never dreamt of trying such a thing. Sure, I did it when I was a kid, but my results were as poor as one would expect. Once I began to mature as a hunter, I became a firm believer that you never hunt a stand more than once in a five-day period unless it is the height of the rut. By sticking to that philosophy, I was able to keep my stands fresh. However, as we all know, such "freshness" comes at a cost. Many times, food sources are ultra-hot for a brief time and then go dead. Take, for example, an oak ridge I used to hunt. It was relatively short and surrounded by bottoms of poplar and spruce. Because it held the only oaks for quite some distance, deer and turkeys flocked to it when those trees began dropping fruit. In years when the trees dropped slowly, the ridge offered hot action for about a month; when there was a condensed mast drop or poor acorn production, it could be over in two weeks or less. Using the five-day rule, in even the best years I got to hunt that stand only six times. That isn't so bad, but the years that yielded only two sits hurt. I was unable to give one of my best stands a fair chance to produce. Truth be told, if it weren't for the work I've done with outfitters, I'd still be applying that rule. But after helping various hunt operators for over 10 years now, I've come to realize that, in certain situations, deer are somewhat more tolerant of human disturbances than I originally believed. This isn't anything revolutionary. During the rut, bucks rarely cling to a regular travel pattern. They employ a highly effective system of covering ground, allowing them to check the greatest number of does efficiently. In doing so, they don't commonly cover the same ground two days in a row. Thus, the chances of the same buck busting a hunter and being there to do the same thing the next day are poor. Even if the buck is there, paired up with a doe, who knows how many "new" bucks will be in the area? Waiting does keep the resident does ignorant. There is an advantage when hunting a doe trail or bedding area. On the flip side, with stands geared towards roaming bucks, such as funnels between doe groups, the benefit is minimal. In situations in which the hunter has a bunch of great stands, it may not be a bad idea to rotate during the rut. However, when one funnel stand is better than the rest, I believe the hunter is hampering himself by not hunting that stand hard. The next scenario is when you can get in and out undetected. Though it may not appear so, that was the case with the food plot stand I described at the beginning of this piece. My stand was at the end of the plot, so all I had to do was walk a vehicle trail to the edge of the plot where my stand was hung. The trick was waiting until the area cleared of deer. Once that happened, making a hasty retreat got me out undetected. To further make certain the deer remained ignorant, I wore Elimitrax. Doing so ensured that I left no foreign odors on the ground or vegetation. In this case, it is very important not to get busted in the stand. One must be extremely conscious of wind direction and excessive movement. Next, the hunter must get in and out undetected. As importantly, he must not leave odors behind that educate deer to his presence. I firmly believe deer become aware of hunters from the odors we leave behind more than any other single factor. In most cases, repeatedly hunting a stand requires a hunter to take extreme odor-reduction steps and/or not cross trails. The only ways I have been able to consistently pull that off is to either wear Elimitrax or to spray down rubber boots with scent neutralizer and apply straight doe urine to boot pads. As much as we've been taught that overhunting a stand is a sin, I am not the only one to come to the belief that repeatedly hunting stands can be beneficial. I'd be remiss if I didn't note that Greg Miller was the first I saw dare to refer to this in print, right here in the pages of this magazine. There is one other scenario in which pounding a stand site can work, but it certainly won't work everywhere. Deer have the ability to adapt to humans. This can plainly be seen with urban deer, in many heavily farmed areas, and in other settings where human presence is a constant. With repeated exposure to humans, deer (assuming they are not harmed) become tolerant of, even seemingly oblivious to, humans. In these settings, a stand can be hunted as often as one desires. A great example of this is a stand site at Bluff Country Outfitters. "Buffalo County has many areas that see a lot of human activities to begin with," notes Tom Indrebo. "With all the farming, logging and ATV riders, there are spots where deer see humans a couple of times each day. When that happens, it gets to the point where they stop caring. I know that is the case here on my home farm. "During the off-season, I'm in the woods almost every day. A lot of the times, there are two or three other guys helping me clear trails, put in food plots or hang stands. When the season comes, I typically have five or more guys hunting the home farm. I used to try to convince them to rotate stands more and hunt some of my other farms. They don't want to. Who can blame them? They're seeing mature bucks almost every sit. "I have one stand that I can't keep hunters out of," Tom continues. "It is on the side of ridge, right on the edge of a bedding area. Conventional logic says that this is the last place you want to send hunters day after day. Seemingly worse, my hunters walk past bedded deer almost every time. The deer lie there unalarmed and watch them pass. They even know the hunters are in the stand. All they do is glance up once in a while. The deer have become so used to it that they don't pay any attention at all." I had my doubts about this when I first began hunting with Tom years ago. Because I was always hunting other farms, from stands I had hung myself, I felt I had a tremendous advantage over the hunters he set up on his home farm. With my rotational scheme, I was sitting stands that were as fresh as daisies. Still, night after night, sitting around the dinner table I would find that those hunters who had been sitting on the home property had seen as many deer as I had, if not more! Now, I might be hard-headed, but the parade of trophy bucks they were dragging in taught me that Tom's approach works best for that farm. "For that farm" is the key component of the previous sentence. Tom's other farms don't see the same level of human activity the main one does. Because of that, he's very careful not to overhunt them. In doing so, they are every bit as productive as his home farm. The key to knowing if you can pull this off is observing deer. If they blow out at the first sight of a human, they will alter their behavior if they know they're being hunted. 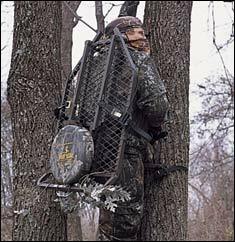 As noted, getting to and from a stand is a key consideration. Often, this is different based on the tendencies of the humans in the area. Most hunters realize that farm trucks and tractors almost go unnoticed by deer in farming country. In that setting, being driven to the stand is nearly as good as being teleported there. But that isn't the case in every setting. I recall the first time I hunted northwestern Missouri. As I drove across the native grass field, I was mildly surprised to see deer running away. Because they were well over a half-mile away, I was sure their panic had nothing to do with me. It wasn't until the same thing happened the next day that I became curious as to what was going on. Returning to camp, I relayed how perplexed I was with what I had seen. Chuckling, the outfitter explained that "the good ol' boys" around there spend most of rifle season hunting from trucks. With that revelation, the mystery was gone. On the flip side, I used to believe that driving ATVs to stands was one of the worst sins a hunter could commit. I now know so many people who swear the deer in their area don't care that I tend to believe them. It depends on what those deer see as a threat. It's their own experiences that teach them what's dangerous and what isn't. In the aforementioned area of Missouri, trucks often equal death to deer, and they know it. Meanwhile, in some other areas, any motorized vehicle is seen as harmless. Human scent is yet another area in which not all deer have the same tolerance level. Regardless of where I hunt, I always go through the same fanatical scent-reduction routine before a hunt. But that wasn't always the case. In my hunting infancy, not only were there no carbon suits or scent-killing sprays, I didn't even shower before heading out. Much of the hunting I did was on my uncle's dairy farm. Most times, I would show up and help him milk cows before grabbing my bow and heading straight to the stand. Looking back on those trips into the woods, I don't think I ever got winded when I went straight from the barn. Did deer smell me? Of course they did. However, I inadvertently duped them into believing I was the same harmless farmer they were used to smelling nearly every day. Conversely, when I showed up late, skipping chores before hunting, I'd get busted silly. Another example is the experiences of one of my cameramen. He hunts two urban pockets of deer. Utilizing the same odor-reduction techniques I do, he still had to make every effort to avoid being winded by deer - that is, everywhere but in the urban pockets he hunted. There he never had problems. Sure, while sitting on stand he'd be annoyed watching kids riding their mountain bikes, pet owners walking their dogs, and people doing various other things. Still, it was those people who caused the deer not to give the bowhunter a second thought when the animals caught a whiff of his familiar human scent. The underlying point is that different deer have different tolerance levels for human activities. If bucks are moving in and out of the area repeatedly on their own, having one bust you doesn't necessarily ruin your chances for tomorrow. It also can be that repeatedly hunting a hot stand is fine, provided you can get in and out undetected. Or maybe you're hunting one of those areas where deer have simply become ambivalent to the presence of humans. The best way to assess this is to just use common sense. If you're hunting a remote area, it's not good to sweat before walking through a bedding area to hunt the same stand for the sixth day in a row. But if loggers have been cutting in the area for the last month, odds are your truck won't bother the deer much. When you analyze how local deer have been exposed to human presence, you might find some tolerable disturbances that apply to your own hunting grounds. And in the end, that might be all the edge you need.